Today, 2015 December 7th, is the seventy-fourth anniversary of the WW2 attack on the U.S. Navy base in Pearl Harbor, Hawaii. (In Japan, because of the time difference, it was December 8th here). Former U.S. airman Jack DeTour, 92, and Japanese fighter pilot Shiro Wakita, 88, sworn enemies during World War Two, together poured whiskey from a battered canteen into Pearl Harbor on Sunday to commemorate the 1941 attack on the U.S. naval base. As the sun rose over the USS Arizona Memorial, the two former enemy pilots joined the “Blackened Canteen” service on the eve of the 74th anniversary of the Dec 7 attack, which took 2,403 lives and drew the United States into World War Two. Standing side by side after meeting for the first time ever, retired Air Force Colonel DeTour and former Imperial Japanese Navy Zero Pilot Wakita together gripped the war-torn U.S. military-issue metal canteen and poured whiskey into the watery grave of the U.S. Navy ship sunk by Japanese bombers. Now a symbol of friendship, the scorched war relic was recovered in 1945 in Shizuoka, after two B-29 U.S. bombers collided overhead. The 23 Americans killed were buried alongside Japanese citizens who died in the bombing raid. Found among the wreckage was the blackened canteen, filled with whiskey, and it was kept in Japan to remember loved ones lost. Since the 1980s, Japanese residents have regularly brought it to Pearl Harbor for the ceremony aimed at maintaining peace. “To know we have this friendship is great. It’s fantastic,” said DeTour, who wore a purple flower lei over his dark suit. DeTour now lives in Honolulu and was a young man from Oregon when he joined the military in 1942. There were no Pearl Harbor survivors among the World War Two veterans attending this year’s canteen ceremony, said Gary Meyers, spokesman for the Pacific Aviation Museum Pearl Harbor. The last surviving officer from the USS Arizona, Joseph Langdell, died on Feb 4 in California at age 100. An internment service for Langdell, who was a 27-year-old ensign sleeping in quarters on shore when the surprise attack was launched, will take place at Pearl Harbor on Monday. At the canteen ceremony, Dr Hiroya Sugano, director of the Zero Fighter Admirers’ Club, said he keeps the canteen in his possession and carries it to the ceremony each year because it is a powerful symbol. “The blackened canteen is an inspiration for peace,” said Sugano. 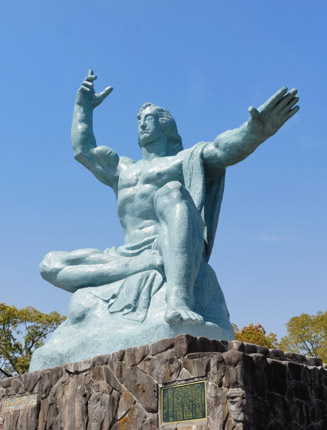 Today is the 70th anniversary of the 1945 August 9th atomic bombing of Nagasaki, Japan. The 「平和祈念像」 (Peace Statue) in the 「平和公園」 (Peace Park) in Nagasaki. I first came to Japan in 1990, the year of the 45th anniversary of the bombings of Hiroshima and Nagasaki. Just as there is every year, there will be a memorial service in Nagasaki today to mark this solemn occasion…and a moment of silence across Japan at 11:02AM, the time that the bomb was dropped on the city seventy years ago. Today is the 70th anniversary of the 1945 August 6th bombing of Hiroshima, Japan. The 「原爆ドーム」 (Hiroshima Peace Memorial). When I first came to Japan in 1990, it was the year of the 45th anniversary of the bombing of Hiroshima and Nagasaki. As always, there was a special memorial in Hiroshima today…and a moment of silence at 8:16AM across Japan. Paper lanterns were set afloat near the Peace Dome in Hiroshima today in a ceremony to mark the 70th anniversary of the atomic bombing. Today, 2013 August 15th, is the sixty-eighth anniversary of the day that Japan surrendered to the U.S. in 1945. It’s called 「終戦記念日」(“VJ Day”), and it was the event the signified the end of World War II. As I mentioned last Tuesday, August 6th was the sixty-eighth anniversary of the atomic bombing of Hiroshima, Japan. And now today (2013 August 9th) is the same anniversary of the atomic bombing of 長崎 (Nagasaki, Japan). As I mentioned in my post about Hiroshima, the famous 原爆ドーム (Hiroshima Peace Memorial Museum) is in Hiroshima. Nagasaki has a peace memorial to remember the war, honor the victims and hope for peace, too. It’s in 「平和公園」 (“Peace Park”). The Peace Memorial in Nagasaki’s Peace Park. The atomic bomb was dropped on Nagasaki on 1945 August 9th at 11:02AM (Japan time). So, there will be a moment of silence in Japan at 11:02AM today just as there was last Tuesday for Hiroshima. Today (2013 August 6th) is the sixty-eighth anniversary of the atomic bombing of 広島 (Hiroshima, Japan). This is a photo of 「原爆ドーム」. The name literally means “Atomic Bomb Dome” but it’s usually called “Hiroshima Peace Memorial” in English. Today in Japan at 8:16AM, there will be a moment of silence. Anne Frank (アンネ・フランク) would have turned 84 years old today, June 12th 2013, if she were still alive. Have you ever read “The Diary of Anne Frank” (アンネの日記) ? She received the diary as a present from her parents on her thirteenth birthday. She began writing in it immediately and continued for two years until she and her family were captured by Nazis in early August 1944 when she was fifteen. Her father was the only member of her family to survive the hard-labor concentration camp. He had her diary published after the war when a family friend, who had kept Anne’s diary safe, returned it to him. “The Diary of Anne Frank” wasn’t immediately successful in Europe, and it was mildly successful at first in America…but it was an immediate bestseller in Japan! She definitely wrote “something great”…and she’ll go on living forever!